Rudolph S. Chow, director of the City of Baltimore's Department of Public Works, shares three decades of insight in the course of 10 questions and answers. Rugged and resilient. These are traits easily ascribed to Baltimore’s citizens, but can the same be said for its infrastructure? Like many large, East Coast cities (think D.C., Philly, New York, Boston), Baltimore has a water and sewer system that was as well-built as any in history when it was constructed, but even the most rugged and resilient will succumb to age at some point. These days, Baltimore’s Department of Public Works (DPW) must respond to an average of three daily water line breaks and manage a sewer system often overwhelmed by volumes of storm- and wastewater that exceed capacity. Luckily, DPW has a true “Water Champion” in its director, Rudy Chow, who has served in water and public works for more than 30 years. Chow has initiated numerous programs and policies to help overcome common big-city challenges and improve the lives of 1.8 million residents in Baltimore and its five surrounding counties, many of whom live below the poverty line. That financial pinch also extends to DPW itself, despite its $1-billion annual operating budget, because of the size and scope of work to be done. 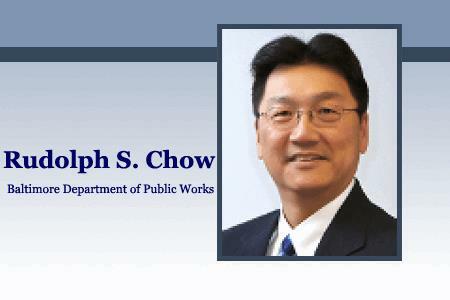 For understanding and addressing the needs of both citizen and city, Chow’s “transformational agenda and visionary leadership” were recently cited by the Water Environment Federation (WEF) at its May 2017 Great Water Cities Summit, while DPW was acknowledged as a “best-in-class organization.” The following Q&A sheds light on why such praise is well-deserved. What would you consider the biggest challenges for Baltimore DPW? As is the case with most jurisdictions, Baltimore faces the challenge of old infrastructure that is subject to failure. At the same time, we need to upgrade our water, sewer, and stormwater systems due to increasing regulation. Health and safety are foremost concerns, but paying for these necessary infrastructure projects adds hundreds of millions to our capital budget. We also face a steep challenge in paying to repair and replace this infrastructure because about one quarter of Baltimore’s population lives at or below the poverty line. The funding structure for these massive infrastructure projects is such that local taxpayer and/or users of these systems have to pay for them; there is very little financial assistance from state or federal (or private) sources. Affordability is an issue with widespread consequences. From a utility management perspective, what resources are most needed for DPW to overcome these challenges? I have worked as a representative of Baltimore City DPW, of industry groups, and with elected officials at the state and federal levels to find new money for water infrastructure investment. We know that investments in infrastructure create jobs and lift local economies. And these are investments that serve the needs of generations of citizens. Baltimore DPW has, among other things, developed programs to help minority and women-owned small businesses benefit from this investment and contribute to our local economy. Our country needs to invest in basic infrastructure in order to provide our children the lifestyle taken for granted by their grandparents. Quality people are essential to any organization's success. What is DPW doing to retain and recruit talent? First, we prioritized the recruitment of talented young engineers. A citywide job classification review allowed for new entry-level positions at higher salaries. DPW is participating in regional Chesapeake Water Environment Association and American Society of Civil Engineers job fairs, and making presentations at regional and national gatherings of professional organizations. We recently hired more than 30 engineers within 12 months, giving them one-year employment contracts and encouraging them to seek permanent employment with us. We also launched our Baltimore City Water Industry Career Mentoring Program, to link industry veterans and leaders with young people who need assistance getting into the world of work. The idea for this came in 2015 during a dinner meeting with industry leaders. We recruit mentors to provide real-world, on-the-job training, along with support and guidance regarding workplace success. Our recruits are typically 18-24, with a high school diploma or GED but not enrolled in college or job training. The program is in its third year, and most of those who are accepted into the program go on to complete it and successfully find jobs upon the end of the program. Whether it was planned or not, has automation come to replace institutional knowledge? How do we preserve old-fashioned "know how" for the next generation? We’re making efforts to digitize our old records so they will be available, and useful, when we need them. Of course, we’re also upgrading our technology as needed and as it fits into our capital planning. In either case, training will always be important. And in many cases a level of demonstrated competency will be a requirement. I have emphasized to all of our employees, regardless of their job classification or years on the job, that they must always look to add skills and learn something new about their jobs — and about other people’s jobs. Further, we have been hiring young engineers with the specific aim of rebuilding the institutional knowledge from within. We have stepped up our recruiting from area universities, both to tap into the regional talent and with the expectation that they will want to build their career with the Baltimore City DPW. I’ve also made sure that when we hire consultants, we find ways to learn from them so that we build our own set of skills and abilities. Consultants should be adding long-term value to DPW, not just doing a job and leaving. That’s another way we can take someone else’s “institutional knowledge” and incorporate it into our own. What have you learned about Millennials, if a generalization can be made, in the process of recruiting and hiring young professionals? Millennials want to be engaged and to contribute as quickly as possible. So we have strategies to focus new engineers on technical and programmatic engagement. New hires are selected to work with chief engineers to complete specific technical studies. New engineers are required to rotate through the various branches of DPW, essentially learning new skills for a new job at each new stop and keeping them interested and motivated. Our newly hired engineers also participate on teams to develop and implement DPW’s strategic plan. We encourage all new hires to join DPW Goal Teams to extend their knowledge of and involvement in the Department. Beginning in 2014, engineer applicants have been invited to specialized presentations, including one-on-one networking with DPW managers. They even have sessions with me. You recently took part in the WEF's Great Water Cities Summit, speaking to your leadership and the strides Baltimore DPW has made as an organization. What changes has DPW made to improve operations? Among other changes, I instituted an Office of Strategy and Performance to make sure our business model is operating as efficiently as possible, and producing measurable results. We set goals and milestones, and build in accountability. Managers are responsible for making sure our goals are met in a timely manner, which means making sure all of their employees have the information, guidance, and resources to achieve the goals. I want the stance of DPW to be proactive, not reactive. I created our Office of Asset Management to make sure we are constantly assessing the infrastructure in place and directing repairs as needed. I have directed our Bureau of Solid Waste to take the lead in the fight against grime instead of just responding to complaints. We expanded our rat abatement program so that we are looking for emerging infestations and not waiting for citizens to report sightings. We distributed more than 170,000 trash cans in 2016 to make sure that every household has a durable container with an attached, tight-fitting lid. Now, nobody has an excuse for not properly containing their trash. And this year we opened a transfer station in order to allow small commercial trash haulers to have a convenient option for disposing of loads of refuse. This should also help drive down instances of illegal dumping. What specific efforts have affected consumer engagement, and in what ways? Our water billing department, called Customer Support and Services Division, has been evolving in recent years. We upgraded our metering and billing operations simultaneously, and this has put considerable pressure on this part of our operations. We’ve added staff, increased training, extended hours, and upgraded our technology. We have community liaisons to bring our message into Baltimore’s communities, but also to listen to what our customers are saying and try to respond to what we’re hearing. We’ve made greater use of social media to communicate, and were the first public agency in Baltimore to adopt the Nextdoor message board platform. In 2016 we delivered brand new trash cans to every residential customer in the city, literally as well as symbolically putting a means of cleaning the city into the hands of our citizens. Technology is a big help, but every day we strive to work person-to-person to deliver good customer service. Old infrastructure such as Baltimore's will always create challenges. What are DPW's particular issues, and how are you approaching resolution? Our sewer collection system, now more than 100 years old, is entering a modified consent decree with the EPA, following the expiration of the first consent decree that directed us to fix the system to prevent sewer overflows. We’ve found this to be more complex, time-consuming, and expensive than the 14 years and $1 billion than we initially anticipated. In addition to repairing and replacing sewer pipes, we are now going to tackle a longstanding hydraulic problem at one of our sewage treatment plants that prevented it from freely draining hundreds of millions of gallons of wastewater into the treatment plant. This project will take more than three years to build and cost several hundred million dollars, but it will prevent more than 80 percent of the overflow by volume. On the water side, we are repairing and replacing at least 15 miles of water mains each year. This will cut down on the frequency of water main breaks, typically about three per day, and ultimately save both money and water. We are also looking at a long-term solution for our 102-year-old Montebello Water Filtration Plant. This was a state-of-the-art facility in its day, but we cannot count on it to keep producing safe, great-tasting water without a major investment. It is a lot work in a relatively short period, and it is driving up the cost of water and sewer service, but we need to invest now in order to have systems that not only provide for the public health, but are also safe, environmentally-friendly, and reliable. Has DPW done anything else to improve revenue and/or minimize losses? We established an Office of Asset Management to actively test, assess, and direct follow-up action for our mains, service lines, and operating facilities. As result of adopting asset management methodology we can assign risk factors and prioritize our capital programs. For example, we have been more actively checking and replacing/repairing water valves, transmission mains, and service lines. By having more reliable valves, we are able to limit the outage due to water main breaks to smaller areas. The result is more reliable service and a better product for our customers. We upgraded our metering and billing operations to assure our systems are efficient, reliable, and accurate. The new, wireless meters provide more usage data, providing an efficient, reliable, accurate experience for customers. In this way, customers can more clearly see usage trends and spikes, and take corrective action to stop unexpected usage. At the same time, we now have greater confidence in our meter reads and are able to have better information when there are billing disputes and requests for adjustments. We have even changed our management structure to build in better goals that align with our mission, and accountability. Our new Office of Strategy and Performance is leading reviews of our various bureaus and offices in order to keep our operations at high, efficient levels. Rather than push goals from the top down, our Goal Teams involve employees from all levels and all units in order to gain insights from everyone. What are your goals for the future to continue Baltimore DPW's leadership role? I want all of our operating units to adopt best practices in their field. Our leaders are expected to share and implement what they have learned when they return from conferences. They are also expected to share their own knowledge and experience at professional gatherings. I expect us to keep the needs of our customers in mind when we make decisions and go about our jobs. The residents, commuters, and visitors to Baltimore deserve our best possible service. We must meet or exceed all regulatory standards, and the expectations of our local elected officials. Baltimore deserves to be a clean, safe, healthy, economically vibrant city, and DPW will continue its efforts to deliver the services necessary to make that happen. As water and wastewater industry professionals, we collectively champion the cause of clean, sustainable water. But there are also standouts among us who lead the cause and shape the industry through profound influence and achievement. They are the subjects of Water Online’s new “Water Champions” Q&A series, sharing unique insight to inspire peers and promote solutions. See the inaugural article, Water Reuse Within Reach: Guidance For Potential Practitioners, featuring the Director of Water Resources for the San Francisco Public Utilities Commission (SFPUC), Paula Kehoe.